Creamy goat cheese and pesto mayo pack a ton of flavor into these hearty sandwiches, stacked tall with grilled portobello mushrooms and a bounty of summer veggies. There are three things I absolutely love about these sandwiches. They are packed full of veggies, something we could all use a little more of. They are so simple and easy to make. And they’re really impressive and delicious with a ton of great flavors going on, perfect to make for friends! I made these twice this summer, and will probably keep making them until it’s too cold out to use the grill. Which, here means about February. Grilled veggies are one of the best things ever. Grilling them brings out so much flavor. If you can get your hands on some end-of-season local veggies, those would be amazing. But if not, grocery store varieties will do just fine. With my never ending basil supply, I of course am always making my own pesto. But you can definitely let someone else do the work for you here and use the jarred stuff. The veggies are seasoned really simply because the strong basil and tangy goat cheese bring so much flavor to this sandwich. A definite winner! Preheat grill to medium-high heat. Brush portobellos, eggplant and zucchini with olive oil, then season to taste with salt, pepper and garlic powder. Grill veggies until soft and grill marked, about 5-6 minutes on each side (the mushrooms will take a little longer than the others). Whisk together pesto and mayo. To assemble sandwiches, spread the pesto mayo on rolls, then layer portobellos, eggplant, zucchini, roasted red peppers and goat cheese. Have you ever grilled portobello caps? What’s your favorite thing to top them with?! Portobello mushroom sandwiches are my favorite! I always order them out whenever I see them on menus. I’ve never made my own before, so that has got to change. I love the goat cheese and pesto mayo on here! I’m in love with this sandwich! I love veggie sandwiches that look hearty and filling. And goat cheese? I could it it every day! 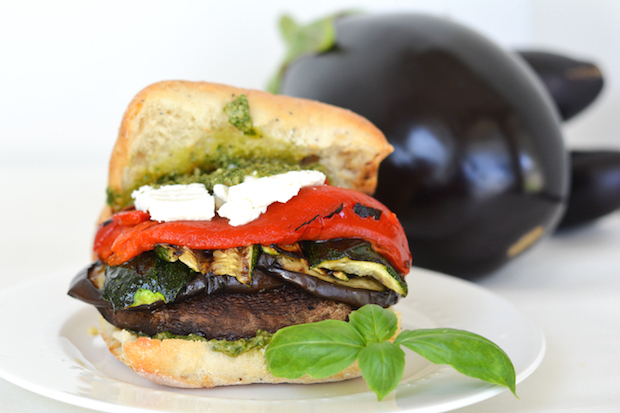 I’ve never had grilled portobellos before…they look so good in these burgers! And goat cheese? Pesto Mayo? I’m loving the looks of these, Jess! Thanks, Denise! You’ve really got to try grilled portobellos— SO YUMMY! I love grilled portobello sandwiches! Yours sound perfect with the pesto mayo and goat cheese! Looks so hearty and delicious! 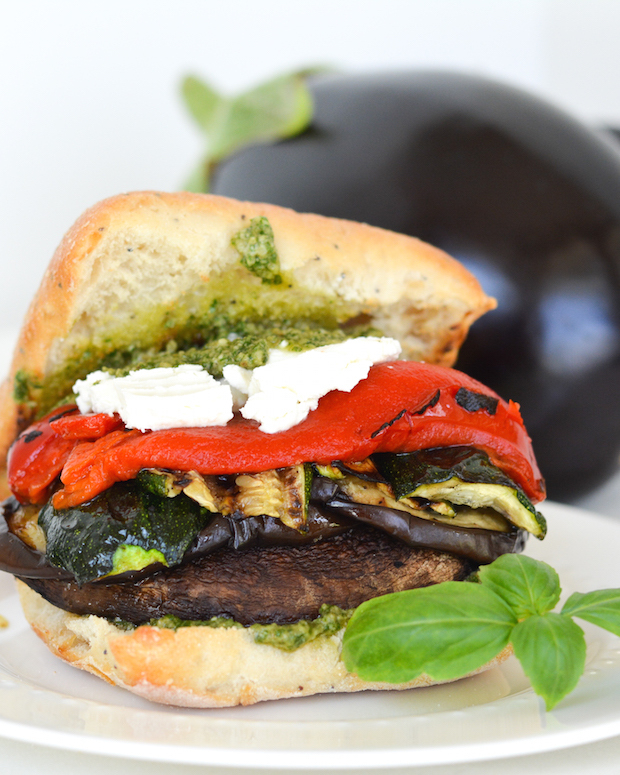 This is my kind of sandwich — I love grilled veggies and that pesto mayo sounds delicious! And goat cheese? This looks so incredible, Jess! This sounds like the sandwiches of dreams! Grilled portobello sounds amazing! This looks like such an amazing sandwich! I love vegetarian meals like this that have so much awesome flavor going on that you don’t even miss the meat! Pinned :). I’ve heard that grilled portobello mushrooms are really good, but I haven’t tried them before. I think that needs to change though because this sandwich looks incredible! Ahhh! You have to try them! SOOOOO amazing! !